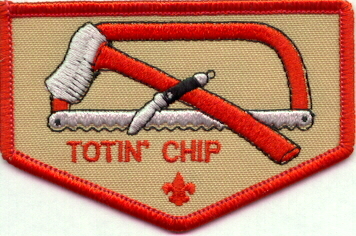 The Official BSA Totin' Chip is the Wallet Card shown above (No. 34234B) and/or a Patch (No. 08597). The older versions of the Totin' Chip card (No. 4234, 34234 and 34234A), shown below, are also in wide use and are still valid. NOTE: As far as we know, the patch shown below is NOT issued by the Boy Scouts of America. Check with your local BSA Council to see if it is authorized for wear on a Scout's Uniform, and if so, where to place it. It can be obtained from some private patch manufacturing companies and from some local BSA Councils. BSA now issues the patch shown at the top of this page.